For those with a lot of books and little space to store them, the Sapien Bookcase (2003) by Bruno Rainaldi provides a unique solution. By holding texts horizontally in a vertical stack, the Tall Sapien can accommodate up to 70 small and large books in a very compact footprint. 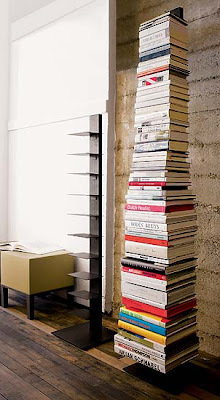 (The shorter bookcase will hold up to 50 books.) The removable shelves are a mere 2mm thick but each one can hold approximately five books, or an impressive 20 lbs. The tall Sapien has 14 shelves, and the short Sapien has 10. 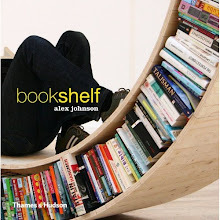 When fully loaded, the bookcase virtually disappears behind the books. All-metal construction and a heavy, weighted base ensure the design's strength and stability. The durable lacquer finish is available in grey and white. Made in Italy.